You can get this quest from guard watching the entrance bridge to Dyrford Village (#1). But if you miss him, you can also get it from Lord Harond in the Dracogen Inn (#2). Lord Harond will tell you that his daughter Aelys disappeared one night while the two of them were staying at the inn, and that she's probably still in the village somewhere. If you ask the locals -- such as Dengler (#2), Winfrith (#3), and Hendyna (#4) -- about Aelys, then you'll learn some interesting things about her: that she was looking to escape from her father, that she was pregnant, and that she spoke at length to Trygil (#5). When you ask Trygil about Aelys, he'll tell you a fishy story about how the two of them were lovers, and how during one of their trysts, an ogre grabbed Aelys and ran off. With enough Perception, you'll be able to challenge this story, which will cause Trygil and his assistant Sabhan to attack you. You can also make the pair hostile by visiting the lair of the ogre in Dyrford Crossing and discovering that Aelys isn't there, or by trying to enter the back room of their shop, or by showing Trygil the Tattered Note from Dyrwood Crossing. Trygil and Sabhan should be pretty easy to kill. To enter the back room of their shop, you'll either need Mechanics 7 or the key hidden in one of the dying vats in the main room. Inside the back room, you'll find a ladder leading down into the Dyrford Ruins (Exit A). You can also enter the ruins via a set of stairs in Dyrford Crossing (Exit B). Inside the Dyrford Ruins, you'll have to contend with hostile Skaenite cultists plus a bunch of high-level locked doors and traps. So it's a good idea to wait until you have a full party, not to mention a character with at least Mechanics 8, before going in. If you don't have much in the way of Mechanics, then you can pick up a pair of keys (#6, #7) for the locked doors, and just run through the traps. When you eventually reach the ritual chamber (#8), you'll meet Wymund and Aelys. Wymund will tell you that Aelys is really Lord Harond's niece, and that she's pregnant with his child -- which was apparently the only way Harond thought he could continue his line given the Hollowborn problem in the area. Finally, Wymund will add that Aelys has been transfused with the essences of "maltreated slaves and underlings," and that the essences will cause her to murder Harond as retribution for his crimes. You can kill Aelys before she leaves. This will outrage Wymund, and he and the other cultists in the chamber will attack you. After the battle, you'll find an Exceptional Morning Star, Blood-Blessed Skaen Cultist Robes, and a key on Wymund's corpse. The key will unlock the chest in the back of the chamber, where you'll find the unique dagger Aattuuk and Wymund's Journal. Then when you return to Dyrford Village, you'll find Lord Harond on the upper floor of the Dracogen Inn. You'll be able to tell him what happened in a variety of ways. In general, the more aggressive you are with Harond, the bigger the reputation bonus you'll earn with Dyrford Village but the bigger the reputation penalty you'll take with Defiance Bay. If you kill Harond, then you'll find the Amulet of Summer Solstice on his corpse. You might also receive 250-1450 cp. You can let Aelys go. Then when you return to Lord Harond in the Dracogen Inn, Aelys will be there with him. You'll get a variety of things you can say to Harond, including informing him of the transfusion or not. 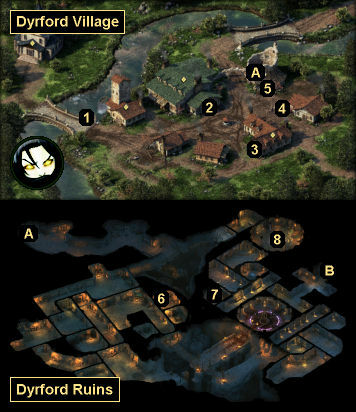 In general, the more aggressive you are with Harond, the bigger the reputation bonus you'll earn with Dyrford Village but the bigger the reputation penalty you'll take with Defiance Bay. Harond might also give you 250 cp as a reward. If you have the Grieving Mother with you, then you can allow her to cleanse Aelys of the transfusion. This will cause Wymund and the other cultists in the chamber to attack you. After the battle, you'll be able to send Aelys into hiding (the destination doesn't seem to matter), but otherwise, this variation will work just like killing Aelys in the first option listed above. Note: As of version 1.06, it looks like the reputation bonuses / penalties for the quest aren't being applied. Entrance to Dyrford Ruins (from Trygil's Curriery). Entrance to Dyrford Ruins (from Dyrford Crossing).